Hi there! 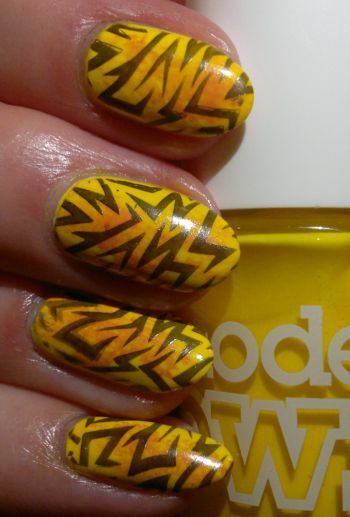 Today’s post is not only the last post this week, but it’s also the last post this Nail Week. 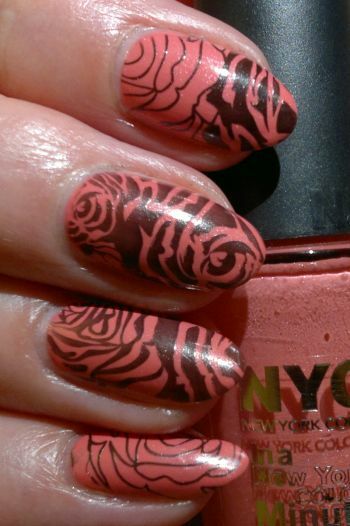 For this mani I painted my nails with NYC In A Minute 258 Prospect Park Pink (2 coats). This is a pretty peachy-pink shade with microshimmer galore. It’s not my favourite nail colour, but it looks amazing in the sun! I thought that a few simple rosey images would look nice with this base colour, so I chose Pueen‘s 80 plate (which is part of Pueen‘s Buffet Leisure collection). 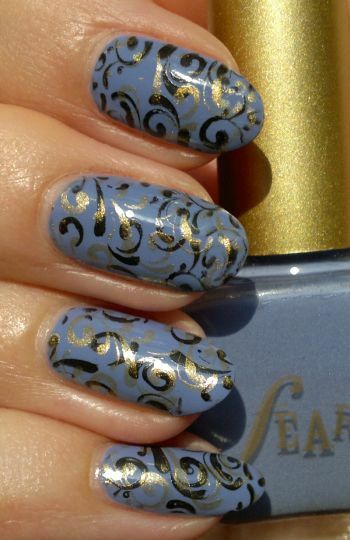 For this mani I painted my nails with Fearne Lola Lavender (2 coats). This is a gorgeous colour. I love it! I decided to double-stamp. 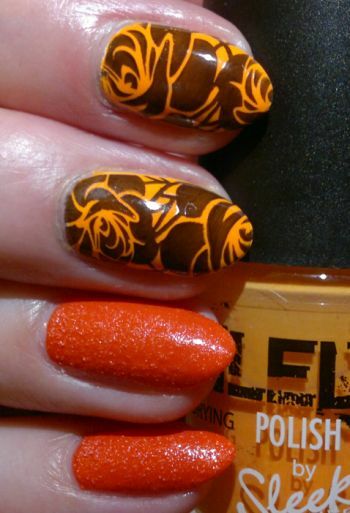 I used my Pueen 73 plate (which is part of Pueen‘s Stamping Buffet collection) and two colour polishes – Revlon Colorstay 270 Stiletto (black) and Revlon Brilliant Strength 110 Hypnotize (gold). 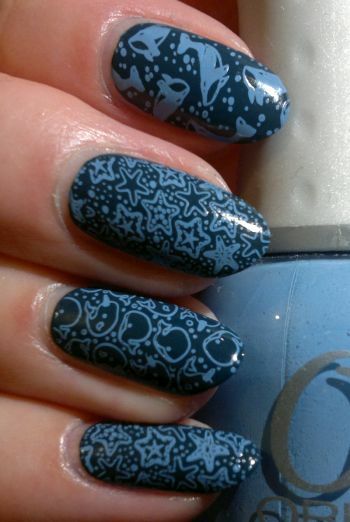 In theory, this should have been an awesome mani, but it was just about OK.
Hi there! 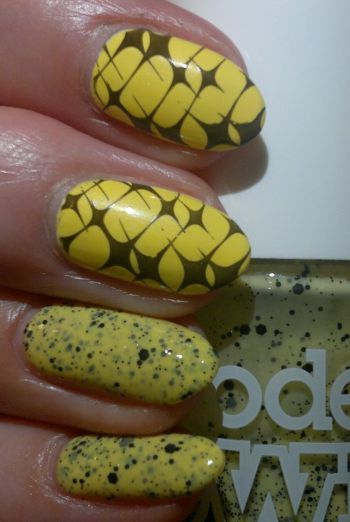 Nail Week is still on, so here’s another mani I did some time ago. For this mani I painted my nails with Primark‘s PS… Snow White nail polish (1 coat). Once the white base had dried, it was time for Models Own Sarong Wrap (2 coats). Sarong Wrap is a low-quality polish. It’s terribly thin, and I don’t think I would have gotten much (or any) joy from it had I not started with a white base. Anyhoo… I thought that light pink accents would look nice, so I used a small piece of a makeup sponge to apply pink polish to my nails. Well, it didn’t look great, but I didn’t have the time to correct the mistake, so I just left it as it was. Then I stamped! 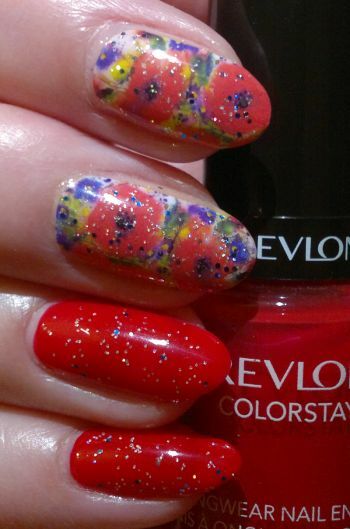 I used Pueen‘s 83 plate (which is part of Pueen‘s Buffet Leisure collection) and Revlon Top Speed 880 Black Star.